Are you an adventurous traveler? Do you enjoy joining new experiences and original ideas to discover the places you go to? Then, there is no doubt: a paragliding tandem flight is exactly what you should do during your next trip to Tenerife. Choose one of our trips and you’ll have the chance to know the island from 700, 1000 and 2.000 meters above the ground. The adrenaline rush you get when you see the world at your feet has no comparison! Is paragliding for everyone? Yes, it is! Our team welcomes all the adventure lovers, especially those ones who appreciate nature. If a paragliding tandem flight is in your bucket list, we will share your excitement for fulfilling one of your dreams. We will only ask you to bring comfortable clothes, sneakers and sunglasses. We will provide you all the paragliding equipment you will need, so you don’t have to worry about buying anything special. Do you need more information? Then contact us. If you have any question, we will be happy to answer it. We are looking forward to fly with you over Tenerife! 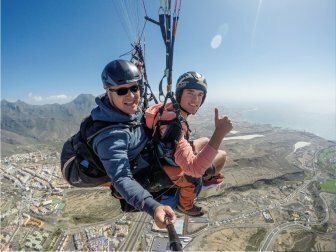 Our paragliding tandem flights will take you so high in the air that you might see yourself surrounded by clouds.What are you waiting for? 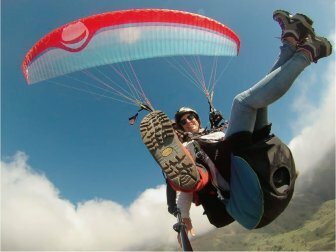 Paragliding is a sport that consists of gliding over a beautiful landscape with the only help of the wind, thermal currents and expertise of the instructor who pilot the glider. The feeling you get when you fly is a combination of absolute freedom and a very special emotion. Overfly Tenerife uses advance tandem paragliders to get the most of their gliding capabilities. That’s the reason why our professional team can take you so high in the air in a ride that lasts from 15 to 50 minutes. Can you imagine a better way to get to know the island? 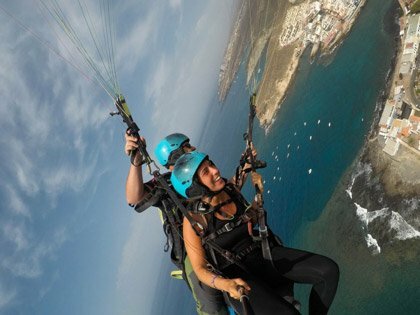 A paragliding tandem flight with Overfly Tenerife should be your best choice if you want to live an unforgettable trip that you will talk about to your friends for a long time. And who knows? Maybe your friends will love the idea so much that they will travel with you back to the island to try the paragliding experience. You have many options, so you can come more than once and get those incredible feelings again. Did you know you can fly over the Teide’s National Park? One of our tandem paragliding flights allows you to watch this breathtaking volcano from the heights. But you can also enjoy the gliding experience in other amazing spots, like Forest Crown and the “Barranco del Infierno”. Overfly Tenerife’s instructors make sure you get the most astonishing views of the island: ravines, mountains, beaches and the ocean… You won’t understand how great our nature is until you see it!